Posted in: Media Release, Update. The search for an attempted murder and attempted bombing suspect is over. 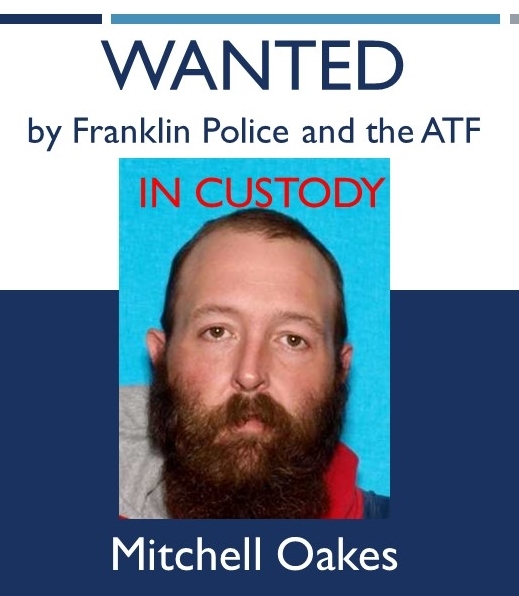 Mitchell Oakes was taken into custody, without incident, at 9am by ATF Agents at a home in Bledsoe County. Oakes was wanted on state and federal charges for Attempted First Degree Murder, Unlawful Possession of an Explosive Device, and Being a Convicted Felon in Possession of a Weapon. He was also wanted on a felony warrant out of Virginia on an unrelated matter. Franklin Police identified Oakes as the man who placed a bomb in a NHC employee’s vehicle. The device failed to detonate when the employee was getting into her car to leave work Saturday morning. A $7,500 reward was offered by Franklin Police and the ATF for information leading to Oakes’ arrest. This morning, the TBI added Oakes to their Top 10 Most Wanted List, bringing the reward to $8,500. Booking, bond, and court date information on Oakes is currently unavailable. The Franklin Police Department is grateful for the support of our local, State, and Federal partners who quickly rallied to support the response, investigation, and arrest in this case. We are relieved to have this suspect off of the street.